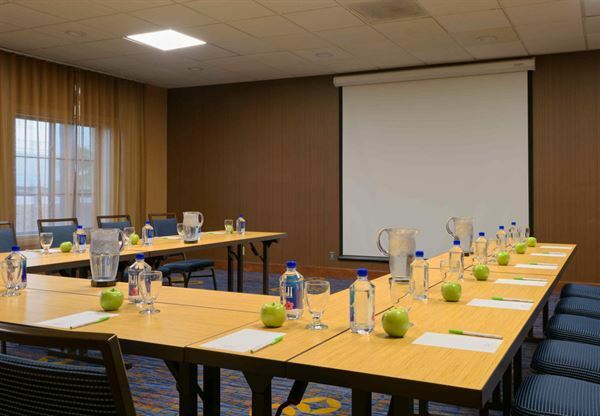 Enjoy the meeting point of convenience and comfort when you stay at Courtyard San Diego Old Town. Less than 4 miles from San Diego International Airport, our hotel is close to the plethora of unique shopping and dining locations in Old Town San Diego. Before you visit the Historic District, get a good night's sleep on our plush mattresses, or finish up some last-minute work using our ergonomic workstations and complimentary Wi-Fi. In the morning, fuel up with cuisine from our on-site dining venue, The Bistro, and enjoy the California sunshine on our outdoor patio. After breakfast, visit our fitness center, equipped with cardio equipment and free weights, or take an invigorating swim in our outdoor pool and whirlpool. If you're planning a meeting or celebration, we offer flexible spaces, custom catering and AV equipment to make your event a memorable one. Whether you're holding a wedding reception or in the area to conduct business, stay stress-free at Courtyard San Diego Old Town. Please see our website for a full list of our event spaces and seating charts.